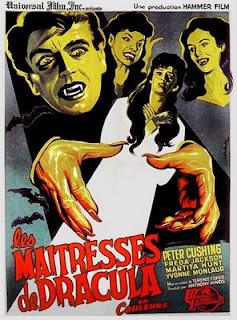 Brides of Dracula is considered as one of Terence Fisher's masterpieces. 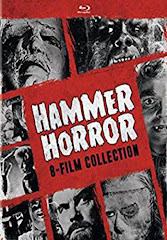 It has become a cult film for generations of Hammer fans. During international conventions I'm invited to, I'm always glad to measure how much this beautiful vampire picture, in which I'm the leading lady, remains fascinating. I owe it a popularity that has never decreased in spite of years gone by ! Brides of Dracula undoubtedly is my career's major film, and all memories it carries along are bound with happiness. 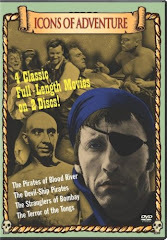 For it also marks my acquaintance with the Carreras family and all the wonderful artists who worked for them and made Hammer a symbol of excellence in the production of fantasy films in the 1960's. Mather, contacted me a few days later. 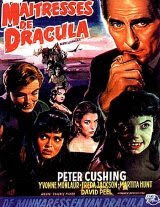 Hammer Films was producing a second Dracula (1). understood the interest of the project. stars: Peter Cushing and Christopher Lee. The mere thought of playing with Peter Cushing was exhilarating. 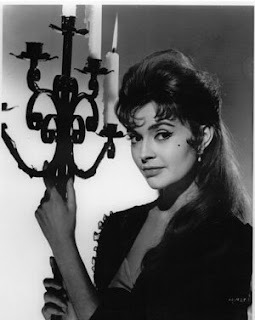 During her journey to the Lang Academy, a young teacher, Marianne Danielle ( Yvonne Monlaur) is offered hospitality for the night by Baroness Meinster ( Martita Hunt ) in her transylvanian castle, where she holds her own son prisoner ( David Peel ). free. She will discover too late that the young baron is a vampire. 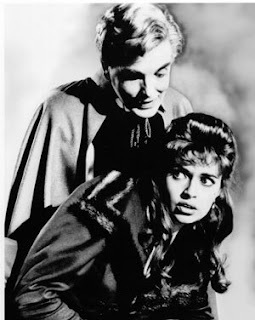 Having bitten his mother, baron Meinster chases after Marianne Danielle at the academy, where she only owes her salvation to the protection of Dr Van Helsing ( Peter Cushing ). while baron Meinster will be annihilated by the crucifix-like shadow of the mill's wings in the moonlight. James and Michael Carreras did not even audition me. 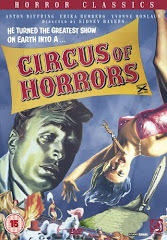 We had a nice meeting, during which they spoke of CIRCUS OF HORRORS, WOMEN IN LOVE and some of my italian pictures. I found an apartment in London, in the West End, on Upper Grovenor Street. During the whole shooting, I left before dawn for the Bray studios in Windsor. Frida, the make-up girl and hairdresser, was taking care of me around 5am. Marian Crawford, my light double, was joining us. The three of us liked to be together and joke while having tea and bacon sandwiches, waiting for the set to be ready. The shooting schedule followed the story's chronology. The first day, we shot the exterior scenes with Michael Ripper (3) and the coach hurrying through the misty forest. Then were the studio scenes, which needed much preparation from Jack Asher the cinematographer and his assistants. Intense concentration was the rule on the sets, tempered by the good nature of our director Terence Fisher. He knew exactly what he wanted, which was reassuring and saved us a lot of time. He shot each scene very few times. Everything was meticulously prepared before the cameras got rolling. Fisher sometimes let the actors think they could play with great freedom. Then, sometimes he insisted on precise points. The tempo of the performance, the tone of voice, all these considerations meant that he was very concerned about the internal rhythm of each scene. Sometimes he simply said to me : quicker, slower, you should be more frightened... or, to David Peel : more sadistic ! screen one of his disciples, baron Meinster. The first drafts of the script were entitled DISCIPLE OF DRACULA then DRACULA 2. 2- London base of Hammer Films. 3- Famous Hammer supporting actor. He played the coachman in the first scenes of the film.